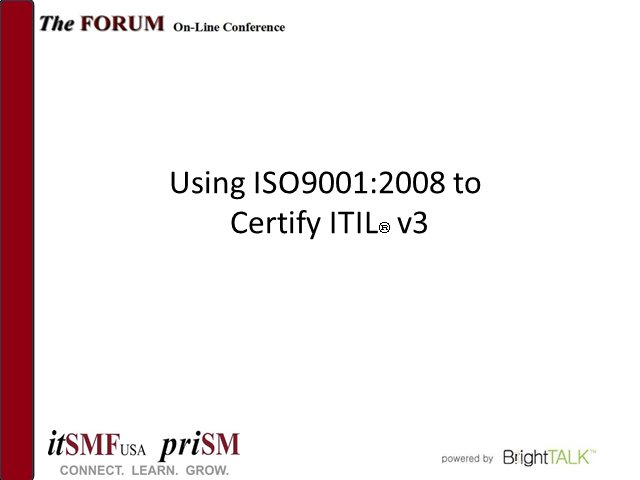 Using ISO0991:2008 to Certify ITIL v3: Extend your current ISO0991:2008 auditing practice to include IT (Information Technology) organizations within a scope covering small to large clients, with a focus on large cross functional IT organizations providing support across multiple business units and outsourced IT organizations. We are aware of the current ISO20000 standard, but wanted to offer an alternative to those clients already ISO 9000 certified. This is yet another framework to add to your arsenal of tools for cost-effective operations!